Rupert Pupkin Speaks: Scream Factorized: THE HORROR SHOW on Blu-ray ""
Lance Henriksen- since he's a cop, it feels like maybe the further adventures of his character from THE TERMINATOR. In this case though, his cop character is haunted by the memories of apprehending a terrible and completely unhinged serial killer. Cult character actor Brion James plays said killer and he plays him quite effectively. I'm a big fan of the late Brion James, but I always wondered how he must have felt being cast in all the roles he typically cropped up in. I'm sure he was happy to be working and all, but man he played some evil sleazy dudes. This might be his most evil and most sleazy(and also one of his scarcer featured roles). He beheads a young girl with a meat cleaver within first 10 minutes or so of the film. Like I said, he's pretty effective, especially during the execution scene early on where he declares quite definitively that he's coming back to get Henriksen's character (his exact words are, "I'm gonna tear your world apart"). And let's talk about Brion James' laugh for a minute. It's almost cartoon-y in its cackle-yness. The sound is akin to what Bugs Bunny's chortle might resemble if he was turned into a demon. James really sticks it to Lance Henriksen in this movie too. Just needles the hell out of him. He harasses him on the phone, shows up as a standup comedian on his TV, and even invades his family's turkey dinner! The thing that stands out and helps the film a lot is the way Henrisken plays his role. He really feels like he is playing it as real as possible. He is genuinely tortured by the things James' is doing to him. Genuinely horrified at the acts of atrocity he commits. I think that the fact that Henriksen's acting style is generally a bit more subdued and grounded goes a long way to bring the viewer in emotionally. I'd say much moreso than in most movies of this kind. Henriksen's "real" reactions to Brion James' Freddy Krueger-esque shenanigans bring with them a true sense of pain and true horror. THE HORROR SHOW has a bit of a SHOCKER vibe by the way. 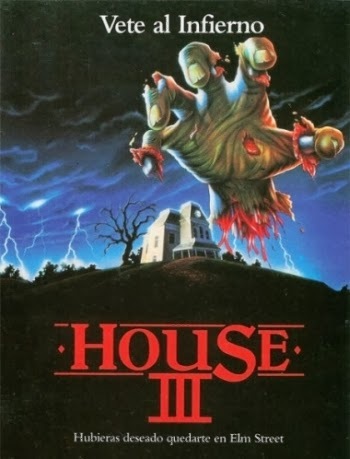 Though both films came out in 1989, this one came about 5 months prior to Craven's. Both movies feature a serial killer put to death in the electric chair and kind of turn into "evil electricity". Both films involve that killer coming back to wreak vengeance on the person that was responsible for their arrest. 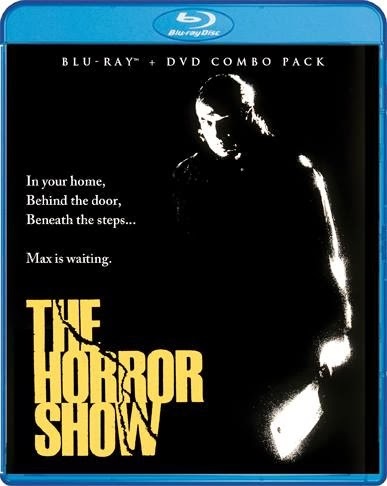 The score for THE HORROR SHOW was done by the wonderful Harry Manfredini, but his music here, while creepy, can't quite live up to his most famous work. The movie also stars Thom Bray(of the Riptide TV series), Lawrence Tierney, and character actor "that guy" Matt Clark. -A Feature-length Audio Commentary with Producer Sean S. Cunningham. 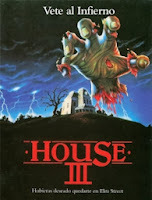 This commentary features Cunningham talking about the origins of the film including his working relationship with Steve Miner and Miner's conception of the HOUSE films(THE HORROR SHOW was also known as HOUSE III mostly outside the U.S.). He goes also goes into his feelings about practical versus digital effects among other things. -"The 'Show' Must Go On! "- an Interview with Kane Hodder, who was stunt coordinator on the film. Here, Hodder briefly discusses his history with Sean Cunningham and then goes into detail about the various challenging stunts he did for the movie. Hodder doubled Brion James in the film so there were several tricky bits of action he did for the film (including a pretty cool fire stunt). -"House Mother" - an Interview with actress Rita Taggart. She discusses her history as an actress and how she came to acting to begin with. She talks about her fandom for Lance Henriksen and how that was actually the impetuous for her deciding to take the role in THE HORROR SHOW.